First Auto Color is an automotive paint shop located near Braidwood, Illinois that specializes in custom aerosol spray cans and touch-up paint for your car. Our custom spray cans and touch ups make sure your car’s paint job stays in pristine condition in any weather. 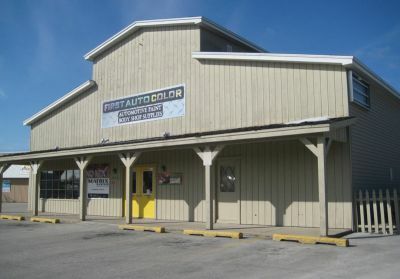 First Auto Color’s Automotive Paint Shop has supplies for all your refinishing needs, including paint primer, custom paint colors, body fillers, masking products, truck bed liners and fasteners, and body shop tools for Braidwood, Illinois. First Auto Color of Braidwood carries only the highest quality brands to ensure you have the best paint or refinishing job. Some of our main product lines include Matrix Automotive Finishes, Transtar and Transtar No-Mix, CPS Industrial Coatings, and Evercoat. Matrix Automotive Finishes has great primers that deliver 3.5 VOC or lower every time, and Matrix Finishes work in all climates, even in the weather extremes in Braidwood. Their ease-of-use makes Matrix Automotive Finishes a great choice for those just becoming interested in doing their own paint jobs. Matrix also created the AccuShade® Intermix Paint System, which, combined with their clear coats, primers, and hardeners gives customers in Braidwood a full range of options. The Matrix Automotive Finishes sold by First Auto Color also include custom paint colors for those in Braidwood, Illinois. First Auto Color also sells Transtar paint, primer, and supplies, including Transtar No-Mix colors for Braidwood, Illinois. Transtar No-Mix colors come in metallic, pearl, and tri-coat shades, and all are low VOC. Some Transtar No-Mix colors are fast-drying, and the Transtar No-Mix Low VOC Basecoat Blender is ready to spray, easy to use, and UV stable. Transtar also has the Ultimate Finish System™, which consists of a Transtar cutting compound, a machine polish and swirl remover with multiple foam pads for the best finish or refinish. Transtar even has glazes to top off any paint job. Another product carried by First Auto Color is CPS Auto Paint, an auto paint company that is UK-based but can be purchased for the paint needs in Braidwood. CPS Auto Paint is specifically color matched to your car to give you a flawless, seamless auto paint job. Also from the United Kindgdom is UPOL, whose fillers and sealers are internationally renowned. Both CPS industrial coatings and UPOL are worth bringing over to give your car a unique look. For dings, accidents, or just a change of style, First Auto Color near Braidwood carries Klean Strip. Klean Strip specializes in products that strip and prime, as well as Klean Strip's wax and grease removers. With Klean Strip products, you can also get rid of rust on your car or convert the rust into a paint primer. Grow Automotive Solvents are another good choice for refinishing solvents. Grow Automotive Solvents carries laquer thinners and enamel reducers, as well as many other paint reducers. Our truck accessories include truck bed liners and fasteners, so you can get your safety equipment and body shop tools anywhere safely and conveniently. Our truck bed liners are durable and the perfect addition to any working truck. Truck bed liners, along with fasteners, make it possible to finish any job and make your truck look flawless. If you need replacement truck bed liners or fasteners in Braidwood, First Auto Color has many options for quality truck bed liners. For your paint shop needs, auto paint, primers, auto body shop tools, masking products, truck bed liners and fasteners, refinishing tools, body shop tools, and custom auto paint colors, come to First Auto Color of Braidwood. First Auto Color specializes in making custom paint colors for any car, truck, or bike. For custom auto paint in Braidwood, come to First Auto Color, where we custom make aerosol or brush touch up custom spray cans to give your vehicle a seamless paint job. Imperfections from gravel, weather, or scrapes can be easily fixed at great prices with our custom spray cans. Pick up a custom aerosol spray can or brush touch up so you can do it yourself. Whether you want a completely new auto paint job or just want to do an aerosol touch up with a custom spray can, First Auto Color has all the necessary items to complete a paint job from preparation of job to completion.